Inspire your imagination, awaken your senses and show off your DVD system. Kaleida’s colorful animations and passionate soundtracks will lift your spirit! Kaleida features the work of digital artist David Turner. 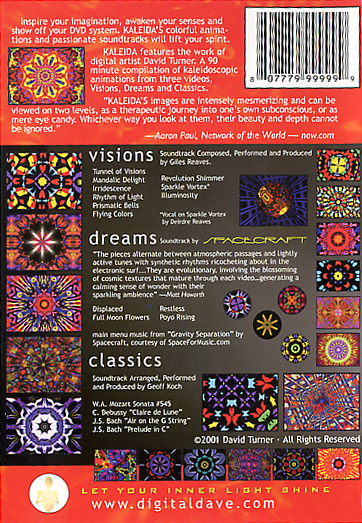 It is a 90 minute compilation of kaleidoscopic animations, containing the full length version of Visions and excerpts from Dreams and Classics.